Would you like to volunteer for Habitat builds, rehabilitation and repair projects? Volunteer your labor and skills, bring a meal to the worksite, whatever your passion is... let us know and we'll add you to our list of volunteers to be contacted on upcoming projects. Habitat wouldn't be Habitat without volunteers like you! Worksite volunteers are required to visit - www.hfhvolunteerinsurance.com, read the course instructions, and take the course. Volunteers receiving a 70% or better on a 10-question quiz will have a certificate of completion sent to our affiliate’s email. All volunteers must sign a liability waiver form prior to volunteering. Habitat for Humanity of Ellis County Board Meetings are held each month. Please email info@habitatelliscounty.org or call 785-623-4200 for location and time of next meeting. All interested persons are welcome. You may decide to serve on an HFHEC committee. Committees include: public relations/fund raising, finance, church relations, site selection, family selection, construction, and family support. 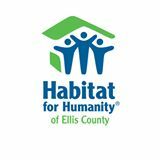 Would you like to donate funds to Habitat for Humanity of Ellis County? Please send a check or money order to the address listed below. Thank you for your generosity!